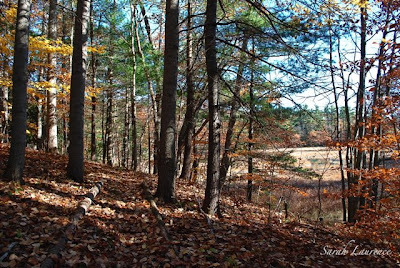 How about a quiet walk in the woods after all that election frenzy? Last night I was at an election party but left to join my 14-year-old son by our TV. For school he’s writing a term paper on Obama’s economic policy. I go to him with my Electoral College questions. Next presidential election he’ll be voting. At 11:00 pm we cheered the results with an echo from Bowdoin students on campus. It was like when the Red Sox won the World Series. Congratulations to Obama! Condolences to McCain. It’s time to move on together. I can’t be the only one who indulged in too much candy. Halloween’s grin is fading into a rotten leer. If you don’t have woods to walk in, come and join me in mine. 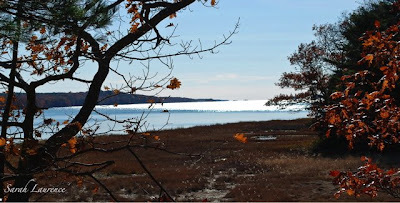 It’s barely 40 degrees, but the sun is shining off the water. 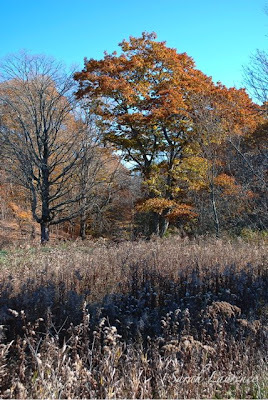 The oaks and beeches are glowing before fading to brown. The sky is a deeper blue in reflection. The clouds are sleeping in this morning. The marsh grass is tawny. 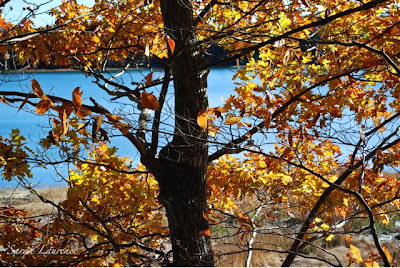 but the late autumn palette is soothing. The wind ripples across the water, but the woods are still. Migrating geese and ducks cut the silence. We are not alone, not yet. The birches are already wearing their winter whites. biking in a T-shirt and shorts past Crystal Spring Farm? My last ride might have been to vote yesterday. 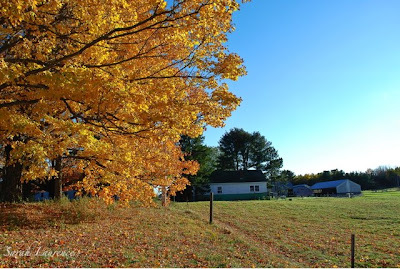 had wanted to see the farm maples in autumn. 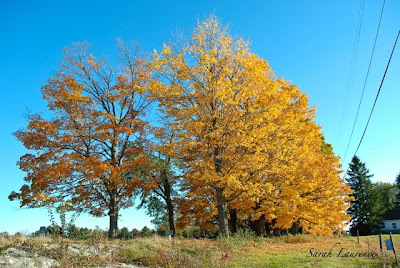 This image of gold against blue I will hold through the long winter. I’m not sad because I love the seasons. 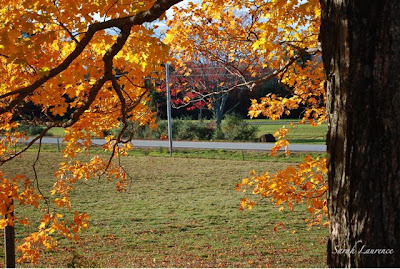 The autumn leaves are all the more glorious because they do not last. so different from the greens and grays of England. ignoring the blue sky out my window. Writing fiction, I look inside. Sarah, in the last six days, I have only left the house to do carpool duty (I've been sick!). I am swooning over your delicious photos. 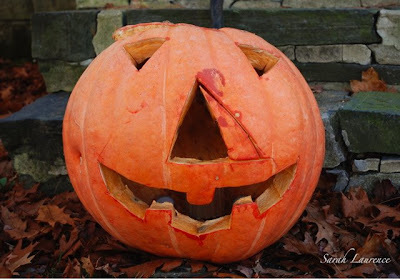 Thank you especially for the photo of the jack-o-lantern. Isn't it strange to think your son will be voting in the next election? Our kids are growing fast. Hi, Sarah--Sorry I haven't commented in so long--I've had trouble coordinating school and writing and gardening and blogging (oh yeah, and traveling). Thanks for sharing your walk--our temps are similar right now (40-ish), and we're moving into the full flush of the fall color. We were walking the election with a colleague's 11-year-old son--we kept asking him how many electoral votes in this state, in that state--it's amazing how much we forget (or don't other to relearn). I know you'll cherish these years with your son--teenagers can be challenging, but they're also very cool. I'll try to be a better correspondent! So beautiful the falls in New England. I do hope your novel is going well. Hard to concentrate with all that color! I'm with you on not being sad on the changing seasons. They are all beautiful. Thank you for taking us on your walk. That picture of the rippling water especially spoke to me. What a lovely walk in the woods. It seems as if we are waking up from a long nightmare. I thought John McCain's speech was particularly good. Perhaps America can go back to being the good America it used to at least try to be. Thank you, Sarah, for inviting us on the walk with you. It was just what we needed to recover from the long, long election process. A nice way to get ready for the next four years. First of all, congrats on such a historic moment for your country and the rest of the world. Secondly, thanks for your comment on my blog. You're right, Margaret Atwood is such a witty and humorous writer that to post that essay by her was the equivalent of devouring a chocolate mousse by myself whilst the children are in bed. How wonderful! Thank you so much for my maple tree! Edward and I greatly wish we could join you in your walk through such beautiful countryside. Thanks for taking us along by way of these photos! I'm reeling at the thought of my 14 year old being old enough to vote in 2012! I will indulge myself in only one teeny political comment and say that both Obama and McCain made truly gracious, inspiring speeches at the conclusion of the election . . . and I hope that we can all greet our new President with an open mind. 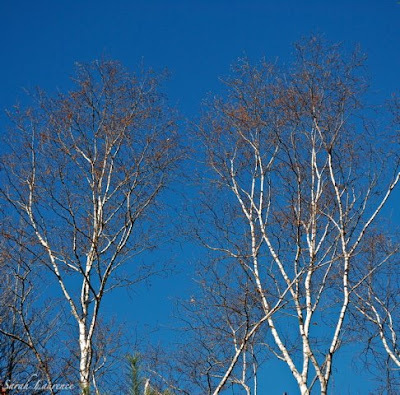 Your picture of the white birches against that clear blue sky was utterly gorgeous -- and a good contrast to the "green and gray" landscape of England. We're getting a whole lot of the gray right now. JAPRA, I’m sorry to hear you aren’t well. The kids are growing up quickly. I’m glad schools are educating our future voters about politics. Welcome back, Cosmo! Absolutely no need to apologize. The beauty of blogging is doing it on your own time. It sounds like you’ve been busy in a good way. Strangely enough, it got into the 60’s today! Kids seem to grow faster as they get older, but I’m enjoying every stage. I love the teen years, honestly! Tina, it’s easier to work now that most of the leaves are down. The novel is experiencing some growing pains but is the better for it. I'm really enjoying the characters and the story as it unfolds. Thanks to Jane, I'm writing faster than ever. It is moving to be part of history. A woman president – yes, but depending on which woman. Hope is great! Alyson, I’m looking forward to checking out the seasonal color on your blog as ours is almost spent. Willow, great leaves and good spirits. We have much to celebrate. Elizabeth, I’m glad you brought that up. McCain gave the most gracious concession speech. I’m starting to believe America is going to move together now. The Grandpa, Obama certainly has his work cut out for him, but what a great start. ACIL, it’s wonderful to see the rest of the world celebrating with us. My son can’t wait to vote. I’m glad he has this election as his example. I heard voter turn out in Maine was over 80%! Pamela, thanks for getting me to slow down to admire the leaves. They are gone now. These are still happy days. Christina, welcome to my blog! You picked such a happy day to visit. I’m looking forward to checking out your blog. Bee, isn’t it wonderful that our kids have this historic election as their example? Our dual nationality children could vote in either country. I agree that the election ended on a good note without lingering bitterness. I was especially impressed by McCain. This bodes well for the future. All, crazy busy day/week. I will come visit your blogs as soon as I can. Loved the walk through such lovely nature. Tranquility is in each snapshot. Thanks for the walk in the woods. I also needed to walk off some candy, and to clear my head of political ads. Until this year, no presidential candidate ever bothered to spend any advertising dollars in Virginia - it was thought to be thoroughly red. I am glad the color wheel is less defined now. Everything looks so crisp and clean there. I can feel the chill in the air from the photos. They are beautiful. I so agree with your comment re the 2 politicians working/moving on together; this is essential. And your very last line...great! I love taking these walks with you, Sarah. We have to enjoy these beautiful autumnal colors while we can. I don't know if your protagonist is happy or sad right now, but it must be difficult after taking such a walk to write anything that isn't joyful. I didn't have an election party to go to, but even watching TV in my PJ's this was the most exciting election night in my memory. In first sentence "quiet" is masquerading as "quite" -who cares, but we are accustomed to editing each other's work, you and I. So glad about the election results. And now, onward! That walk was so refreshing. It was grand to enjoy the clear air, blue sky, changing trees and the wonderful comments of my guide. Rainy here today in New York, and all that moisture can make nice imagery, too. It is fascinating to see how this country, and the world at large, are getting used to the idea of the change that is now definitely coming. I think that we will find that change very refreshing. 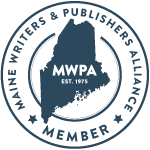 I am an artist in southern Maine and just joined the blog world in mid-October. How fitting that elections come with the changing seasons. Walking is so good for the soul, especially when done in the beauty of nature. 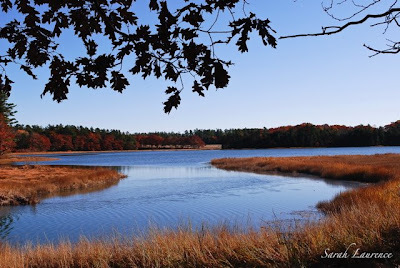 New England seasons and scenery are wonderful, aren't they?! Thank you, Brenda, it was a very peaceful walk. Les, I thought of you when I saw Virginia go blue. I love that through blogging, I can put a face to so many states. Presidential candidates don’t spend many dollars in Maine, and I’m not complaining. I like the debates and the analysis, but the commercials add nothing. It was wonderful seeing record turn outs and so much support for our new president. Phillip, how right you are. The cool air does bring blue skies. Jan, I feel so much positive energy from this election and hope that my country will come together. Rose, you always write such interesting comments about creative writing. Weather affects my mood, but while writing I become totally immersed in my fictional setting and character. It comes as a shock to step outside and to find a different season or country. I do tackle some dark issues in my writing, but my optimism means that there is always some sunshine. These are indeed happy, joyful times. Charlotte, dear editor and friend, thanks for catching that typo (fixed.) It’s great to get some feedback on my prose as my photos normally steal the spotlight. One day I may bring my art and writing together in a children’s book, but for now there is this blog. When that time comes, I’ll get inspiration from your delightful books. Frances, welcome to my blog! How nice to connect with another New Yorker. I haven’t lived there since my childhood, but it stays with me in a nice way. I’m excited about the changes too. Nan, welcome to my blog too! Aren’t we lucky to live in such a beautiful place? Maine inspires art. I’m looking forward to seeing your work too. Shauna, that’s a good observation. Donna, I agree. Nature’s beauty feeds the soul. Sarah, Thanks so much for visiting my blogs and leaving a comment! I left one for you there,too! Looks like another gray rainy day...I like this kind of day for it makes me content to be working inside on my art. It is a truly magnificent palette you have over there! I have been trying to explain to a friend who wants an autumnal photo of the Cotswolds that we usually don't have the same vivid hues that you experience. However I feel challenged now, and now the leaves are turning at last I will find something not grey and greenish even, if I have to walk miles! Very, very pleased about your election results - I tuned in at 4.20 am top listen to the live BBC coverage - the world feels like a better place. Fabulous images. I drooled over them - almost! Nan, much better to stay inside on a rainy day. PG, if you can take a painting break, get out there and snap away. I love the greys and greens of England too. It was fun to see the international reaction to our election and all the good will. Happy news! Such a beautiful landscape indeed. It must gladden the heart to see the gold against clear blue skies. What kind of birds come visiting the birches? you take the most beautiful photos. i could just step into any one of them. isn't fall the most glorious time of year? Anil, I saw chickadees in the birches. They are the Maine state bird probably because they stick around all year. Most of the birds we saw during our walk were migrating water fowl like Canada geese and Mallard ducks. You hear them before you see them flying above or resting in the water. 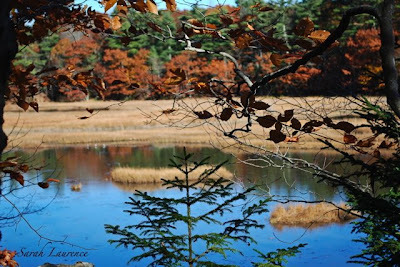 Merelyme, fall in New England is a favorite time of year.